Whitefish populations are strong in many lakes in Central Finland. Whitefish is one of the most important catches but it is also possible to catch with casting tackles. Powan is an common fish in lakes in Central Finland. Fishing with dry flies is most effective when lake is calm in a summer evening and powan are rising to the surface. It is possible to fish powan from shores or from a boat. Powan are shy and therefore you should carefully approach them. Powan rise to the surface when lake is calm during summer evenings. You should cast your fly to the front of the supposed route of a powan. The jaws of a powan are extremely smooth and therefore you should play a powan carefully. Powan swim in swarms along shores. The best time to catch powan is at sunset and sometimes also in the mornings. The weather must be calm and there must be insects on the surface of water. Powan does not come near the surface when it's cold and windy. Small dry flies are excellent for powan in lake fishing. Powan populations are one of the strongest in Central Finland. It is also possible to catch powan in running waters with fly-fishing tackles. Powan trout are shy and therefore you should approach the fishing ground ver carefully. The jaws of a powan are extremely smooth and therefore you should play a powan carefully. Powan is sometimes caught On rapids in Central Finland. Powan are usually in slow flowing parts of rapid. Powan rise a lot and therefore it is easy to find them. The best time to catch powan is at sunset and sometimes also in the mornings. Powan is fished with small wet and dry flies. You can occosionally catch powan on your ice fishing trips. If you want to concentrate on jigging powan, you should go to a special fishing places where there are a lot of powan. A clear-watered lake is an excellent place to jigg powan. It is possible to watch fish which are in shallow water in late winter and then try to fish them. The powan swim along shores to find nutriment. You should stay on the same hole for awhile and change the fishing depth every now and then. You can occasionally catch powan on your ice fishing trips. If you want to concentrate on jigging powan you should go to special fishing places where there are powan. Ranges of rocks, ends of capes, sounds and mouth of brooks. The whole day is a suitable time to catch powan, but mornings and evenings can be better. 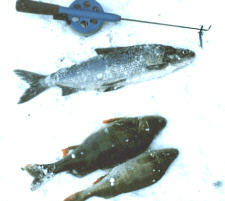 Light ice fishing tackles are enough for powan ice fishing. You should should lay out nets near spawning places during spawning season. Steep banks are excellent places at other times. You should use nets ofmedium mesh size and thin line for powan. Read more about Fly fishing on running waters Whitefish Fly fishing on lakes Whitefish Ice fishing Whitefish Net fishing Whitefish In Finland. Source of nutriment Zooplankton, benthic animals, insects.